Add instant 2-loop effects switching to your pedalboard, without unnecessarily sacrificing pedalboard space! The White Loop from One Control is deceptively brilliant and delightfully simple. With just a single press of the White Loop's loop control footswitch, you can go from one independent effects send/return loop to another. This lets you swap out massive amounts of effects on the fly, without doing the footswitch tango. Don't want either loop engaged? No problem. The entire White Loop is completely defeatable with its own true-bypass switching circuit. On top of that, a pair of DC outputs also provides 9V power distribution for your pedals. 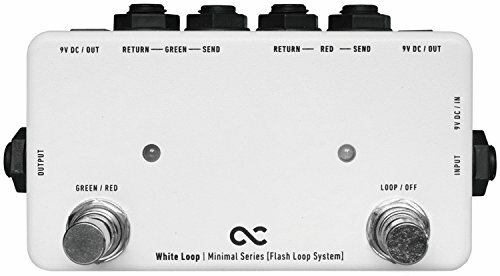 What's more, the One Control White Loop makes an excellent A/B-style amp switcher. Flash Loop Function: Left footswitch toggles between the two (Red & Green) loops. Right footswitch bypasses whole pedalboard Different Uses: AB Switch Amp Channel Switcher Tuner Output/Mute Switch 2x DC outputs to add extra power to your pedalboard The White Loop can be used without DC power, however the LEDs will not function.